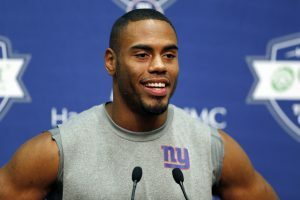 New York Giants running back Rashad Jennings has been announced as a keynote speaker for this year’s 2016 Liberty University commencement happening on May 14. Not only is this Jennings’ alma mater, but it is also special as this is the 43rd graduation ceremony for the school and will occur in Lynchburg, Virginia. Being as that the football player is a native of the area, it will be a fun way for the former students to be sent off into the world on their own for this next chapter of their lives. Jennings was chosen to give this speech not just because of his sports success, but also because he is a huge advocate and fighter for promoting children’s education. The Forest,Virginia native didn’t get a huge start in his early years when it came to his athletic fitness, as he had challenges being overweight and with living with respiratory problems. However, with the help and encouragement of his brothers he got into sports and began to excel in his later high school years. He ended up going to Liberty University where he began to play ball there in 2005, and by 2009 Jennings decided to enter that year’s NFL Draft where he was selected in the 7th round by the Jacksonville Jaguars. In 2014, Jennings signed a four-year contract with the New York Giants, where he still is today. Jennings will be speaking at the 43rd commencement ceremony at Liberty University in Virginia later this month, and it will certainly be a memorable event for everyone who attends.